​Doodle notes have changed my stats class forever and students are able to connect with math like they haven't been able to in other traditional lecture formats. Many of them say this is the first time they have been able to understand math and that the notes give them visual clues and ways to remember what they learned. I find that , just like with interactive notebooks, if you do it- you have to do it alllll the time. ​ Students need organization and routine. If you just do something once or twice it won't mean as much unless you stick with it, follow through, and are consistent (kind of like discipline in our classrooms). This also puts more of an ownership on students to keep track of everything, make sure all notes are taken and homework done if they know they are going to be held accountable. We have a test grade at the end of each quarter. I was hard on them and had a rubric that usually covered about 50-60 pages in their notebook. They had to have it neat, organized, every Note filled out, every activity, homework, review done. No credit was given if they put in a blank worksheet or notes. I kept a box of all the extra copies and it was the students responsibility to get the missing papers they needed from that or get them off our schoology or google classroom site where all the blank copies were as well as pictures of each page and table of contents for each unit. There was no excuse for them to fall behind. ​I don't let them dilly dally and they know they need to keep up. The kids usually start coloring as soon as they get their notes while I'm doing all the housekeeping items at the beginning of class. A lot of time too, they are usually their own self monitor and color in between me talking or doing examples. They've learned to multitask and it keeps them on task. Believe it or not, by doing this my kids usually don't have their phones out while taking notes. The draw of coloring while we're taking notes usually outweighs taking selfies and texting their friends. Don't get me wrong, cell phones are a pain, but my students use them a whole lot less this year doing Notes, activities and the notebook. They are kept busy and on task and worry less about their phones. I love doodle notes and I'll keep using them forever. 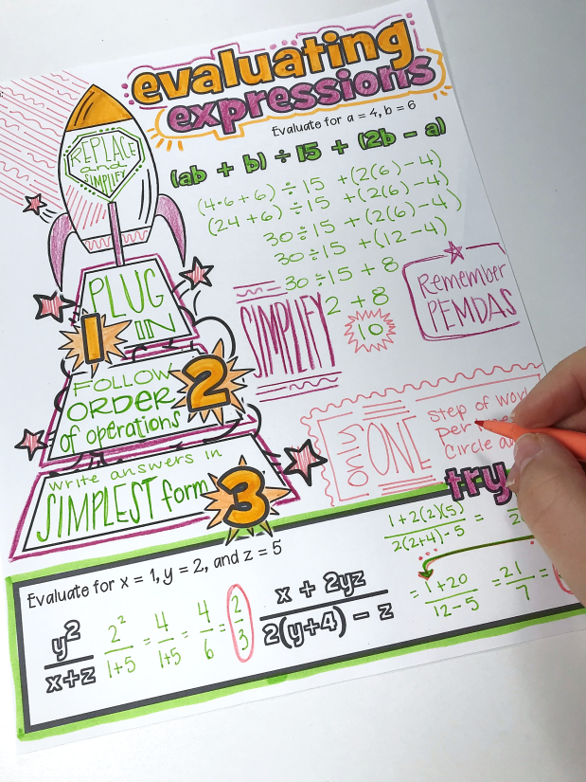 I began using doodle pages November 2016 to reach students who just don't get it, like it or enjoy math. A fellow middle school teacher and I have been searching for ways to help our students learn math concepts like the back of their hand. We were currently using foldable notes but wanted to jazz up the curriculum. She found Math Giraffe doodle pages and now we are hooked. Our entire secondary math department is new members implementing doodle pages. It is a work in process. My students love the doodle pages. They like the color and our scores have increased because of the new method. Helping the students take ownership of their composition notebook is crucial. They will enjoy coloring the doodle pages, and keeping it neat and organized especially if they notice a change in their academic recall. Students glue all of the doodle notes into their composition books by folding them horizontal and labeling the concept to the outside and decorating the half page or quarter if they fold it horizontal and vertical. I use doodle pages to introduce a new concept and as a review. The review is usually jam packed with information. I also include a practice question over the concepts. Doodle pages are fabulous. They can be as simple or complex as needed. 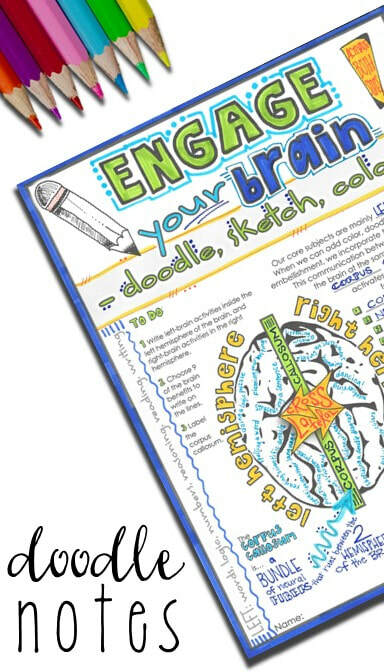 The variety of color, decorative concepts and examples help students to use both sides of their brain to enhance retention. ​My students have a "doodle notebook" where they keep all their pages. It is a very organized system, and it helps when they are studying for a test. The parents are aware of the notebook, as well, so they are able to see what their child has been doing in my class. And my students really like the pages saying it makes studying easier...and they like the coloring! It’s hard to adequately express how much I love using the doodle pages. 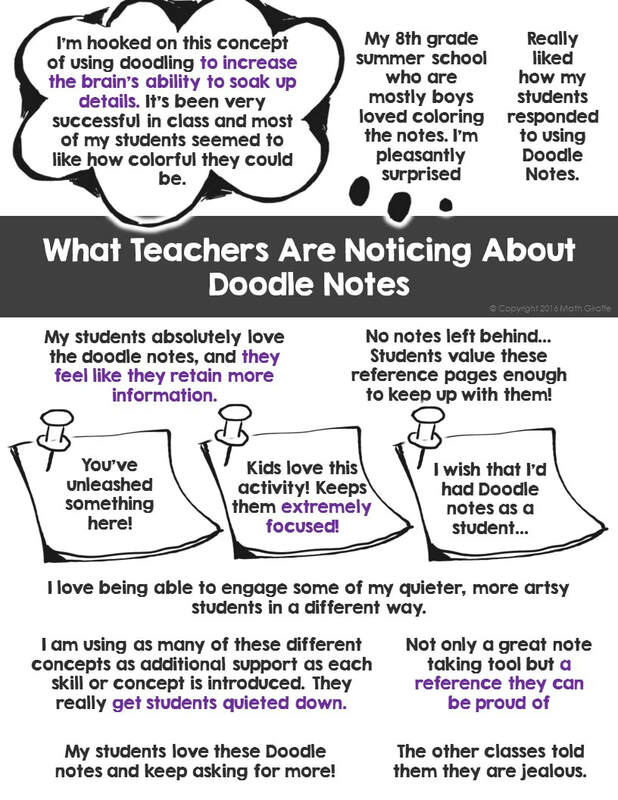 They fuel my creativity in making them, my students' creativity in doodling on them, and just their general appeal of making routine note-taking SO much more fun! The students now will even ask me if this is one I made! And they provide a nice way to kick-off new info...a way to warm them up and subtly start "owning" the new material. And the students just like studying them more when they've been able to embellish them as they like. This is with both the boys and the girls. 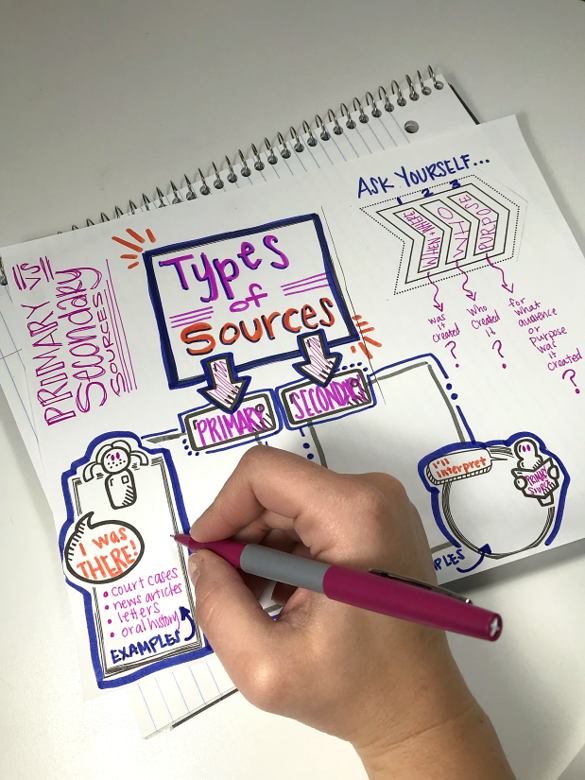 ​I have been using coloring, sketching, and doodling from day 1 of teaching, but I never thought to make it a central component of the notes – it was always in the periphery. I started using them in that capacity this year, and it's brilliant! The students love it! I’ve noticed that doodle notes or other left-brain/right-brain learning approaches are wonderful for using imagery to help reinforce concepts. ​They help with vocabulary and focus, so they're good for films and lectures. They are also a more fun way to set up book work. ​I am in my 11th year of teaching Kindergarten. Since my students are 5-6 years old I introduce the doodle note topic the first day. The second day we begin with just one section or concept on the doodle note. For the 5 senses, we covered one sense each day. As we doodled the section we discussed the sense and each person named their favorite item for that sense. When we covered the sense of taste we named our favorite thing to taste and our least favorite thing to taste. By talking through the concept as the students are filling in simple words and coloring or drawing they remember and retain the information. My students love them and get very excited when we start a new one. I am impressed with how neatly my students work on the doodle notes. They seem to really enjoy them and they take pride in them. It is a nice change of pace since they are calm and focused on what they are doing. I like to make our doodle time different than other times so I often have the students sit together at tables or sit on the carpet using clipboards for a more intimate time. We always discuss the section we are working on and the students get to share a lot during the time. I think making the lessons personal to them as they engage both sides of the brain really solidifies the ideas for them. One of my favorite ways to let students do doodle notes is with the stickers. (And it's by far the easiest!) 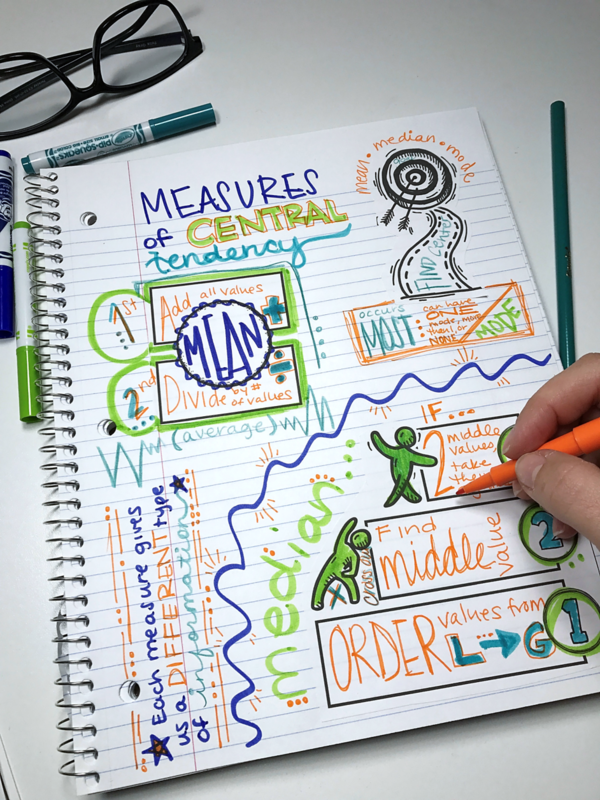 They can create their own visual note from scratch on any sheet of notebook paper. These are so versatile! ​The students love them. The number one thing it has done is create organization for them, kept them on task, and paying attention. Most of them have told me if it weren't for coloring during the down seconds, when it might take 1 or 2 students to catch up writing or answering questions, they wouldn't have paid attention. It kept them focused and all I would have to say is " remember the page with the car on " and it would trigger what we learned that day. They liked being able to use color for different parts of their notes and they were thrilled I was giving them permission to embellish and draw all over their page. 100% doing the notebooks and doodle pages has changed my stats classes for the better. When there were fun pictures and things to color in on the page, difficult material didn't seem so scary to them. Students were more focused, engaged, creative, and learning at the same time. Just try it. We have a variety of students in class and using different teaching tools appeals to all kids. 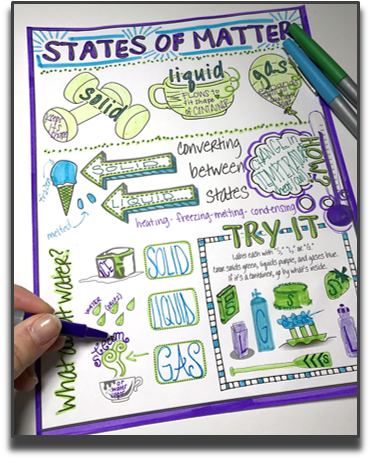 ​Many students also struggle with traditional note-taking so I have been looking for a way to incorporate information with visual reinforcement to really help cement some of the science concepts that can be really challenging. I have only used Doodle Notes a few times, but the students definitely seem to like them. I am by no means an expert. I would say that the doodle notes pages shouldn't come right at the start of the unit, but somewhere in the middle to help synthesize the information or towards the end as reinforcement/review. I have noted that some of the kids' faces do become a bit more animated when we use doodle notes and many like to make them "pretty" or make them their own. Since I already do interactive notebooks, I have bins with supplies like scissors, tape, colored pencils, and hand sharpeners on the tables so that the supplies are readily available and students aren't wandering around to get what they need, I think this is very important. I have table groups with 4 students per table. I also don't give the whole class period to color. We start the coloring in class, I show an example of a completed page on the board, and then I tell students to finish the coloring as homework. ​I also encourage them to underline, outline, or highlight key pieces of information to really make them stand out.